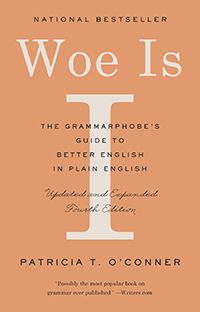 The fourth edition of Woe Is I, a grammar and usage guide by Patricia T. O’Conner ’71, will be published in February 2019 by Riverhead Books. Woe Is I was a national bestseller when it first appeared in 1996, and it now has more than half a million copies in print. O’Conner has also written four other books on language and writing: Words Fail Me, Woe Is I Jr., and, with her husband Stewart Kellerman, You Send Me and Origins of the Specious. She has also written the introduction for a new edition of Robert Graves’s The Reader Over Your Shoulder. The new edition, published by Seven Stories Press in January 2018, restores the original 1943 text of the landmark book on prose style that Graves wrote with Alan Hodge.